British Centurion Mark I Universal Tank during testing. The British had two separate tank functions; Cruiser Tanks were used in armored concentrations, and lacked heavy armor in favor of speed. The Infantry Tanks had heavy armor for supporting infantry operations, but lacked speed. The Centurion was the first British tank to serve both needs, armor and speed - the first "universal" tank. The specifications of the Centurion was formulated by the Tank Board on October 7, 1943 and the tank was designated A41 Heavy Cruiser. In February 1944 front line tank veterans were shown the preliminary designs, and they recommended that instead of a 20mm (.78 inch) Polsten cannon, a coaxial machine gun be mounted instead. This was not taken under advisement, but further design enhancements, including a cast turret, were added based on experience in the Normandy Campaign. The first prototypes were completed in April 1945. 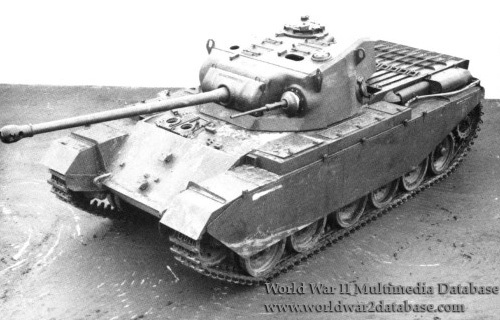 The first 100 Centurion Mark Is mounted the 17-pounder (76.2mm, 3 inch) Quick Firing gun and had performance equivalent to the German Panther. Based on the performance during testing, six Centurion prototypes were sent to Belgium for trials with the 5th Royal Inniskilling Dragoon Guards and 5th Royal Tank Regiment. Arriving soon after the German surrender, the prototypes were tested until July; the 20mm was found to be cumbersome and was replaced with a BESA 7.62mm (.30 caliber) machine gun. Later Centurions had a 20-pounder (84mm, 3.307 inch) and the type was fitted with a 105mm gun after the Hungarian uprising of 1956. Centurions were in use with the British Army through the 1991 Gulf War; some are still operated by Israel today.